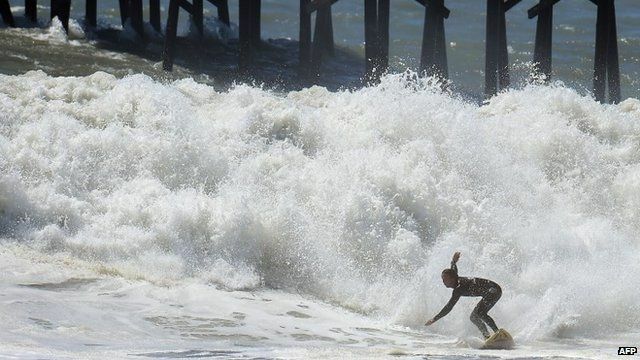 Rides and risks in huge California waves Jump to media player Waves as high as 20ft (6m) in southern California have damaged waterfront homes, knocked out pier pilings and attracted scores of surfers. World's first artificial surfing lake Jump to media player Britain's first artificial surfing lake is due to open in Snowdonia next year. Meet Brazil's silver surfers Jump to media player Each week a group of Brazilian pensioners gather on the beach to take part in their favourite hobby - surfing. Waves as high as 20ft (6m) in southern California have damaged waterfront homes, knocked out pier pilings and attracted scores of surfers. The waves are the result of swells produced by Hurricane Marie in the Pacific, 800 miles (1,300km) west of Mexico's Baja California peninsula.